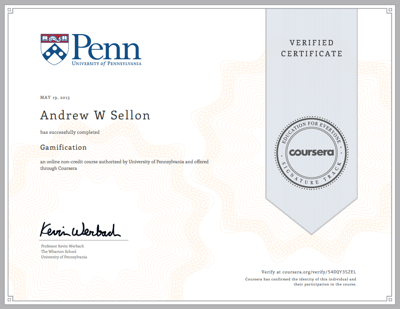 Professor Kevin Werbach’s excellent Coursera offering on Gamification concluded last week, and I have just received my Verified Certificate of completion. I wrote a blog post about my experience with the course, and since that post, I participated in the final Video Office Hours with Professor Werbach, which was both fun and interesting. I also received my peer ratings for my final project (a perfect score from all! ), and I really appreciate the terrific things my peer reviewers said about my work.